On this Thursday at 18:00 UT NASA will hold a press conference on a recent discovery by the Kepler, the exoplanet discovery telescope. I don’t know what to expect, on the basis of past performance they will probably announce a tidally locked super-Earth in the habitable zone of a Red Dwarf as if we have found a second Earth (or maybe they will confirm KOI-701.03 really is in the habitable zone of a reasonably sun like star). Still, despite coming hard on the heels of the 50 new exoplanets found by HARPS, the existing bonanza of Kepler worlds and discovering the atmospheric composition of some exoplanets, one can hardly suppress a thrill at the prospect of learning something new about the plethora of extrasolar worlds we have found. 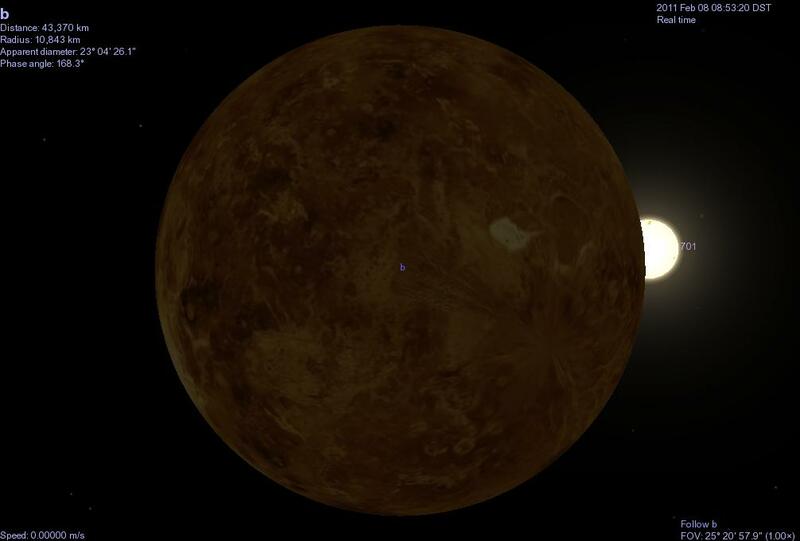 Three years later the first exoplanet was confirmed, and the current count stands at 677. 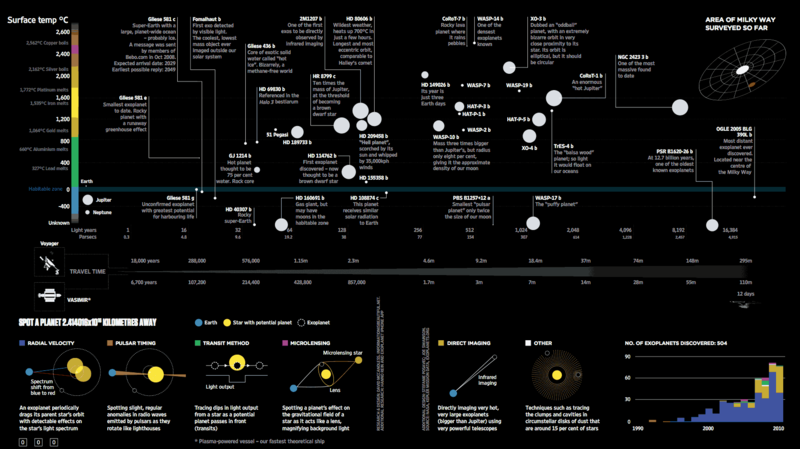 Exoplanets visualized at “Data is Beautiful” for Wired. It’s not the first time a pundit has been wrong, after all the philosopher Auguste Comte claimed that we would never know the composition of the stars, yet 25 years later the spectroscope revealed the elements they were made of (and in 1814 Frauenhoffer had seen the spectral lines that would reveal the stars secrets when chemistry improved). But it’s not the fact the Dembski was wrong (or Paul Nelson, who quoted him approvingly in 1993), but the way that they were wrong. The claim is that “Darwinists” posited a plethora of worlds to fulfil the needs of evolutionary theory, without any strong evidence. Yet Dembski and company couldn’t be more wrong. The 55 Cnc system (excluding the outermost planet), 55 Cnc e is marked by the red cross near the sun. By the 60’s the dominant theory of planetary formation was a variant of the nebular hypothesis, which with further modification became dominant in the 1970’s. It was abundantly obvious even in the 60’s that the implication of this hypothesis was that planet formation would not be a rare event (for example the RAND corporation study “Habitable Planets for Man” published in 1964 used this model as a basis for estimating the number of stars with planets). Then there was stellar rotation. 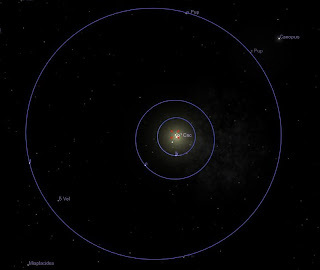 In the solar system, most of the angular momentum is in the planets, and the sun has most of the mass but just a fraction of the angular moment momentum because during planet formation the momentum of the spinning protostellar disk is transferred to the planets. Most sun-like stars have angular momentum like the Sun’s suggesting that the majority of these systems had planets. Dust disk and exoplanet around Beta Pictoris, image source, Wiki Commons..
Observations in the early 80’s of dusty disks around young T-Tauri stars and then dust disks around stars like Beta Pictoris were in line with the nebula hypothesis and strengthened the case that planets were common. George Wetherill’s classic paper “The Formation and Habitability of Extra-Solar Planets” did not come out until 1996, but his work in 1988, 19989 and 1991 on planet formation made scientists confident that solar system equivalents were not rare in the galaxy. Certainly, when Dawkins published “the Blind Watchmaker” in 1986, there was a compelling theory of planetary formation, along with astromomical observations which guaranteed that there would be planets around other suns. When Dembski wrote his words in 1992, astronomers were busy designing the very instruments that would reap a harvest of extrasolar planets just a few years later. Dembski was trying to claim that “Darwinists” make things up to bolster their arguments. Yet Dembski was doing what he criticised “Darwinists” for. If he had taken a few moments to read the astronomical literature, or even asked an astronomer, he could not have made his statement. UPDATE: NASA’s big announcement was a planet orbiting a binary star, a bit like Tatooine, if Tatooine was a frigid gas giant. It could have a habitable Moon though. Evolution News and Views posted a response to this article, my response is here.